Made of patented Open-Air Fibre for optimal hygiene and it won't go mouldy either! Custom comfort for a truly relaxing bath time experience - relax and enjoy! A lovely hot bath can be fantastic relief for back pain – but what if it could be even better? This unique bath pillow from Ideaworks doesn’t just give you the cushioning effect you would expect from any other pillow – it features an adjustable lumbar support, so you can achieve the perfect level of comfort for your body! Simply pull the support up or down as required, its Velcro closures will ensure that it stays exactly where you need it the most. Open-Air Fibre technology makes it so easy to dry after use! Ideaworks’ patented braided, soft fibre material is cosy and light, with great support. Its woven texture allows air and water to pass through easily – this ventilation allows the pillow to dry quickly when not in use, for superior hygiene. No more worries about mould and mildew developing in the damp conditions of your bathroom, simply hang the pillow up after use and the air will circulate through, drying it efficiently for easy storage. Keeping your bath pillow super clean is simple; it can be either steam cleaned or hand washed. When looking for a pillow for the bath, you want to make sure that it enhances the most relaxing part of your day. Other pillows will leave you sliding around in the search for a comfortable position, but with the Ideaworks Home Spa Lumbar Bath Cushion that is a thing of the past! 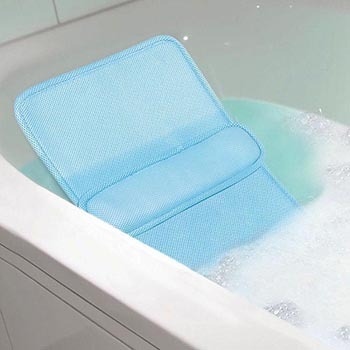 Suction cups ensure that your bath cushion will stay in place, allowing you to relax and enjoy the feeling of being fully supported and cradled. Once you’ve experience the true comfort of its customisable lumbar support you’ll never look back, as you sink into the perfect bath night after night. 15" x 32" x 1"